Aw, you only needed two seconds, didn't you? Yep, this pretty green number is made from four plastic Mountain Dew bottles and exactly $3.72 worth of materials from the hardware store. Not too shabby. It also only took about two hours to make, so let's get to it! First, collect your bottles. You'll need two 2 liter bottles, one 1 liter, and one 20 oz bottle. If you happen to have a Diet 'Dew addict for a spouse like me, this will take less than three days. I found it easiest to cut the bottoms off my bottles with a strong utility knife, and then trim them down further with scissors. Trim them as much or as little as you like: I like my trays pretty shallow, since that enhances the "flower" look. 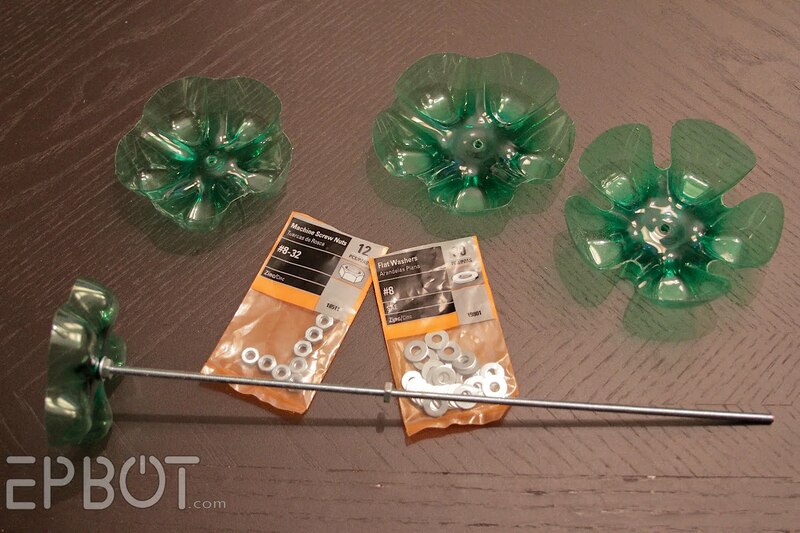 One 12-inch length of threaded rod (no cutting necessary; they come this size in the hardware store) and one baggy each of a coordinating size nuts and washers. Again, these three items cost me less than $4 total. As you can see, the Dremel gives a nice rounded edge to the "v" between each "petal." Then use small nips (I used cuticle trimmers) to trim off any stubborn excess "fuzz:"
Now you're ready to assemble your stand! It's not craft time without a cat or two sitting on my supplies. And now, a few more beauty shots. Can you believe I took these shots at night? The extra high ISOs of the 7D are my new best friend. See all my bracelets hanging on the bottom? 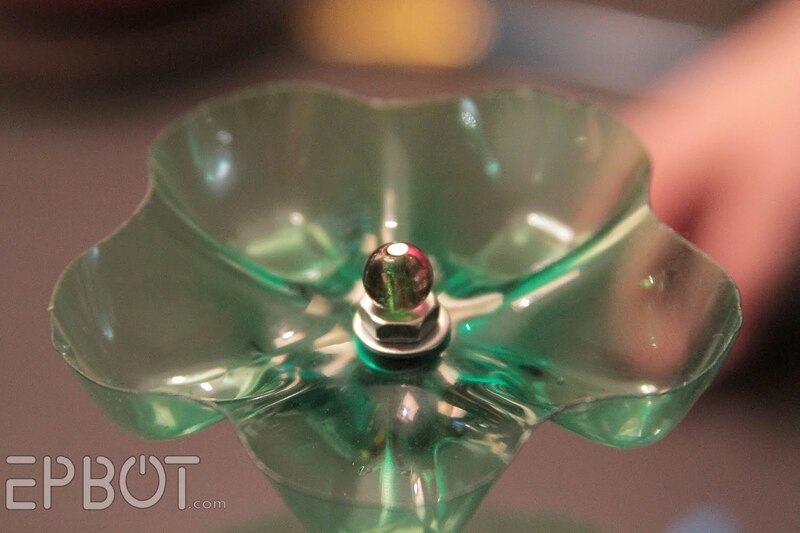 There's also room in each petal to fit a matching ring or pin - and again, the plastic is so strong it doesn't flex a bit. 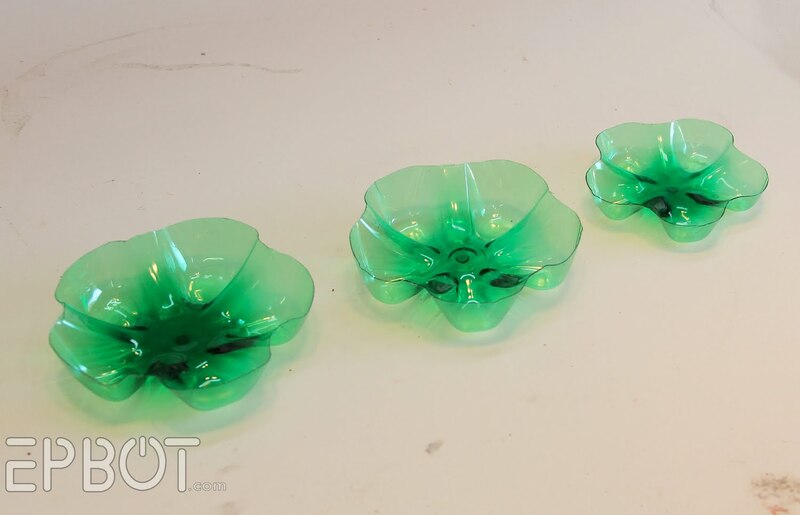 Oh, and you can do this with any kind of soda bottle, of course, so long as you have three different sizes to work with. I'm currently wondering if Orange Crush bottles are actually orange, for obvious reasons. [eyebrow waggle] It'd also be fun to mix colors, although I can't think of any other brands that might have colored bottles. Let me know in the comments if you know of any, won't you? Happy crafting, and as always, please send pics if you guys try this out yourself! Orange Crush bottles (or at least the bargain store brand) are clear. :( But that is sooo cute! Too bad I don't have a dremel, or anyone in my house who really likes mountain dew. I have a Pepsi fanatic, but he likes his in cans and the bottles are clear. Mkay, so it may have taken me .5 seconds longer to get the pun. I kept thinking, "That looks nothing like dew drops!" and then I realized you were talking about the fizzy beverage, and not water. D'oh! Who knew Mountain Dew could look so classy? Does anyone know if soft drink bottle plastic will keep paint up well? Because I don't really drink soft drinks, but I have many friends who live on Coke. I'm thinking I could paint organic-looking patterns on a clear Coke bottle. Stained glass paints adheres to plastic and is hard to get off plastic. Can make designs on a plastic sheet made for that, just lift and peel from sheet when dry. 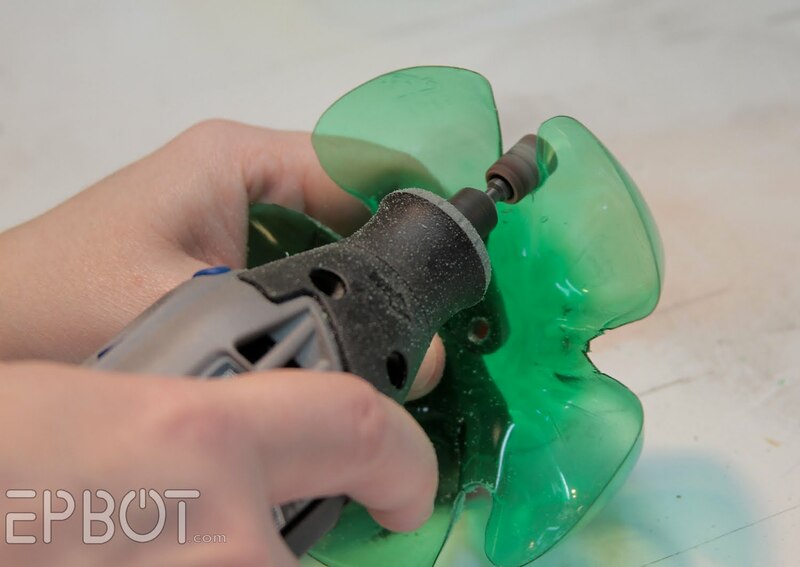 Hint: put thin amount of the clear paint on sheet before doing colors and again after colors are dry. Easier to peal up and transfer to surface decorating. Available mostly on line or Michaels. You could use the clear bottles and paint them. A metallic color or use stained glass paint from a kids craft set. Nail polish is an amazing craft paint. It comes in a variety of colors and you can find it everywhere. looks great and like a fantastic craft idea for kids to do as well (maybe with sandpaper and scissors instead of power tools depending on age). That is too cool! 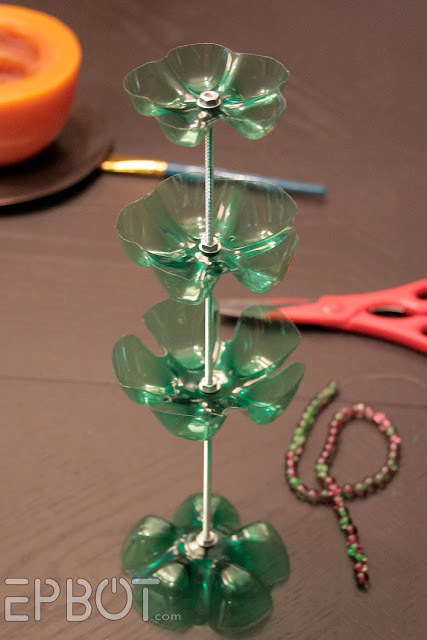 Great idea - reminds me of the water bottle bottoms someone stung together for a "flower curtain". 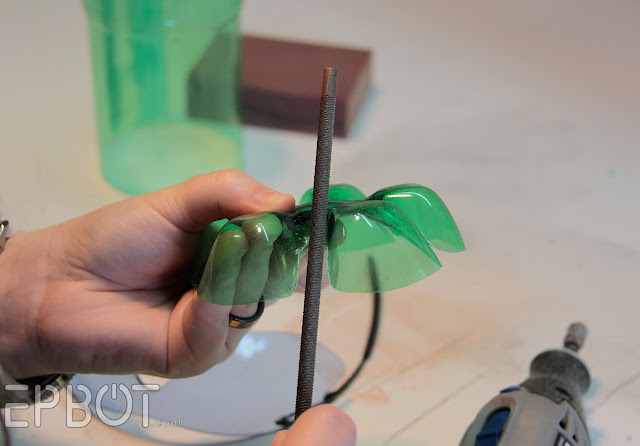 About getting orange bottles: I would try tinting the clear bottles with Rit Dye - the color possibilities would be endless if you can get the plastic to take the dye! You can dye almost anything (including golf balls!) with Rit. I'm not a Dew drinker either, but I think Krylon makes a spray paint just for plastic. And they have some bright colors. I could see this with each petal a different color! I would try Fanta bottles they have all flavors and colors! Also, latin supermarkets tend to carry colorful soda bottles as well. Thank's for the idea! 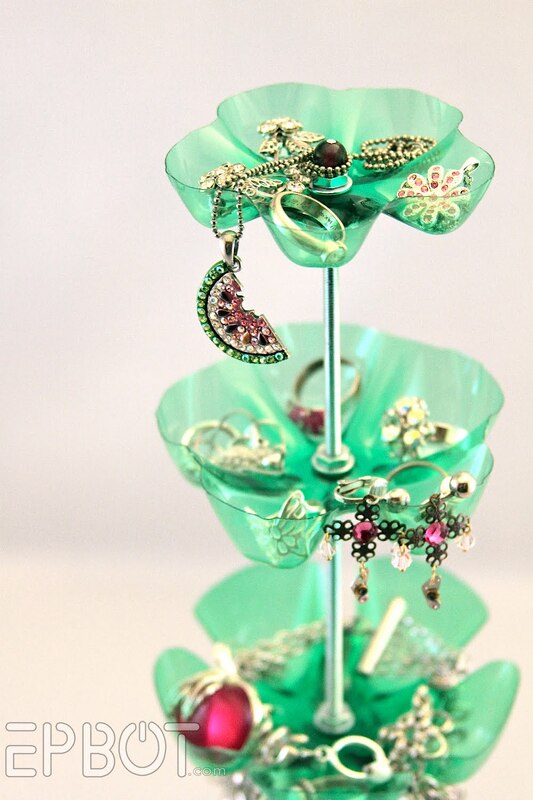 This is a very clever jewelry stand but it would become a cat toy at my house so I will just admire yours from afar. I'm loving your cute watermelon necklace - want :) seriously - where did you get it? That is so creative and pretty! Leave it to you. You're amazing, Jen. I have a question, though - are the sides sharp at all? Because knowing me I'd reach for a bracelet when I was half asleep (which is frequently) and slit my wrist. Or at least get a papercut-like owie, which might hurt worse. Love this! Thanks for sharing. As I read I thought it would be cute to cover the threaded rod somehow. Using cheap colored drinking straws from the dollar store cut to length and slipped on the rod before each ledge would be cute. Might have to give this a try for my tween daughter, she would love it! Orange Crush bottles are clear. But I wonder if that Mod Podge and food coloring technique for glass jars would work on the plastic? I don't see why it couldn't. Lovely piece Jen. I bet I can find at least three DMD bottles in the recycling right now. Totally love this! I pinned this to pinterest so I can find it again when I have time to actually work on this. Here in Denmark we have a soft drink that comes in a greener-than-mountain-dew-bottles-green. And I've seen waterbottles in several shades of "spring in the woods/mountains/meadow"-blue. Absolutely. GORGEOUS! I am flabbergasted that you were able to make some thing so beautiful out of Mt. Dew bottles! I instantly thought, "hey look, a pop stand." Love your ingenuity. What about Fanta bottles? I suppose colored bottles are just something you'd have to keep an eye out for in the grocery store. I'd recomend roughing up the plastic if you're going to paint, it might make it stick better or go the peel-able route and decorate the outside with fabric/puff paint. Change your mind? Peel it off! I'd almost want to get the 3liter bottle and use that at the top to hold necklaces. I say you could paint clear bottles with Krylom on something made to stick to plastic. Just be sure to paint the OUTSIDE. That way your rings and things on the inside don't chip the paint. Ooohhhh, I like the idea and all the comments. I'm thinking stain glass paints on the bottom of clear flowers would be great and then your jewelry wouldn't scratch it up. I like how each bottle bottom is cut slightly differently, I think it looks great! Man, if I were a Girl Scout leader I'd totally have the girls making these. Maybe one option would be to use the clear bottles and paint the bottom of them, leaving the top (the part that gets the most "wear and tear") alone. 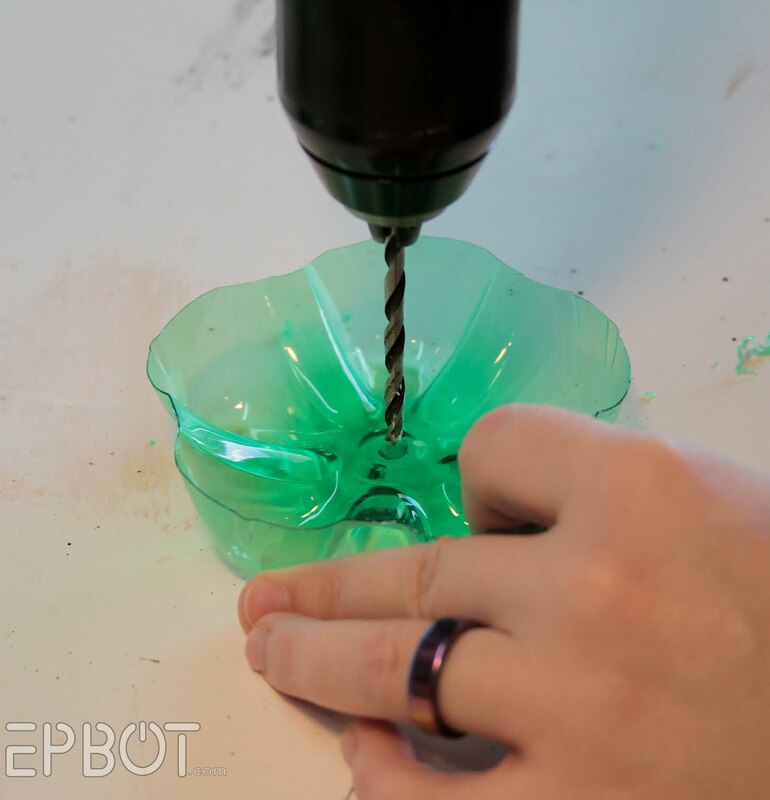 Or paint the bottle and then do a thin layer of modge podge or a clear epoxy coat or something to keep the pain from being scratched off by earring backs or other sharp jewelry pieces. Hmmmm ... I could a see a similar project with little holes for earrings. My daughter needs something for all her bling, but she's lacking in the "be careful" department, so this might just be the simple holder she needs. Too fun! I wish I had jewelry so I could have an excuse to make this. Jen, you could easily incorporate your crafty ideas into a DIY book. I would certainly buy it! As much as I love Cake Wrecks, your own amazing crafts prowess blows the crappy cakes out of the water! Unfortunately Orange Crush bottles (name brand or not) are not orange. I can only think of 3 colors of bottles which are clear, brown, and green. Fabulous! Now if you could create a jewelry solutions for long necklaces that does NOT involve 23 cup hooks being screwed into the drywall, I would be your new best friend. Jen, if you feel like responding--I was really curious why you chose to go with silver tones for the metal (I mean besides the obvious that they came that way) instead of something Steampunk. You know, coppery or bronze or something more antique. I would love to know! I did something in school that we painted bottles and it did not stick but that was awhile ago so maybe they have different paint now. Or sand the bottle a little. This is awesome and beautiful at the same time. I really want one, but am not so crafty with the power tools. 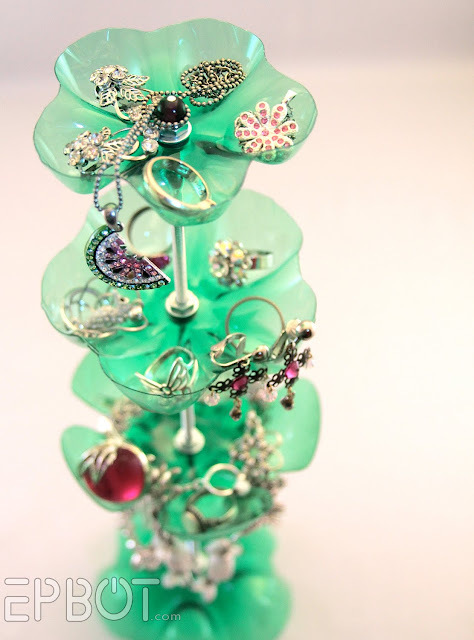 All my jewelry is kind of thrown on top of the dresser. The only other colored soda bottles I can think of are A&W, Squirt, and ginger ale. And of course the last two are just variations on a theme of green. What the heck is that purple bottle next to the stand? First I thought it was nail polish, but that would make the stand super tiny. The stand is cute, but next time put better objects next to it to show scale. Clear bottles & decoupage FTW! where i live they make softdrink special editions (mostly winter, so nothing available now), that come in orange and light purple bottles. only two sizes though, 1/2 liter and 1 liter. still, i might keep an eye open for those next fall, i don't have a lot of bling, so two stories will work fine for me. 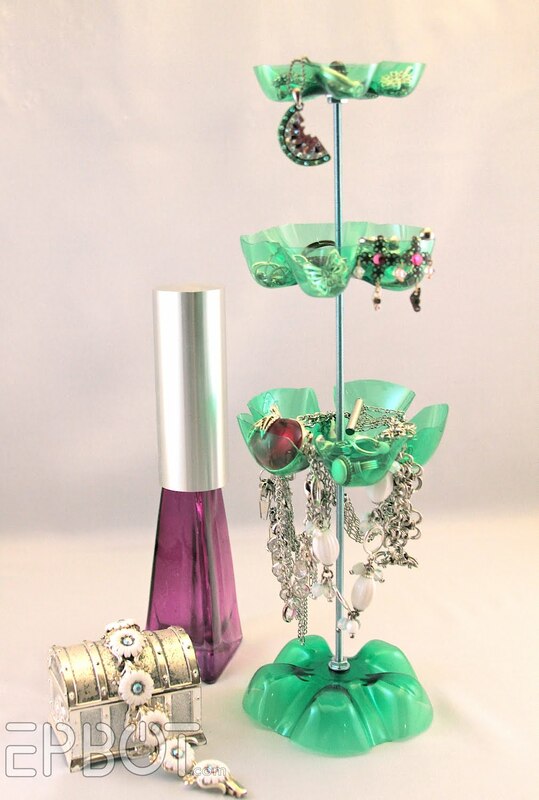 I'm the diet dew drinker here, I use the bottles for making jewelery pieces and containers. I never thought about this though. I will have to make a few of them. If you want different colors all you need is the spray paint that adheres to plastic. Got me thinking now. Got something in mind, when I make it I'll send a picture of it...not even gonna give you a hint, but it makes sense to me....Thanks for the blog. Great project! Also, seriously... that new camera. I think I may be a little in love with it too. Those pictures are gorgeous. Love it! You are super talented. You could also wrap string or yarn around the rod for added color. And Anonymous, who was complaining about the scale, she told us the threaded rod was 12" which is the only scale we should need. You did a wonderful job explaining every step of the way. This is awesome! Alas, my own kitty would have this thing emptied and all my jewelry under the fridge in less time than it takes to put it together. The caption "It's not craft time without a cat or two sitting on my supplies" made my day. It's so true! That's so pretty! 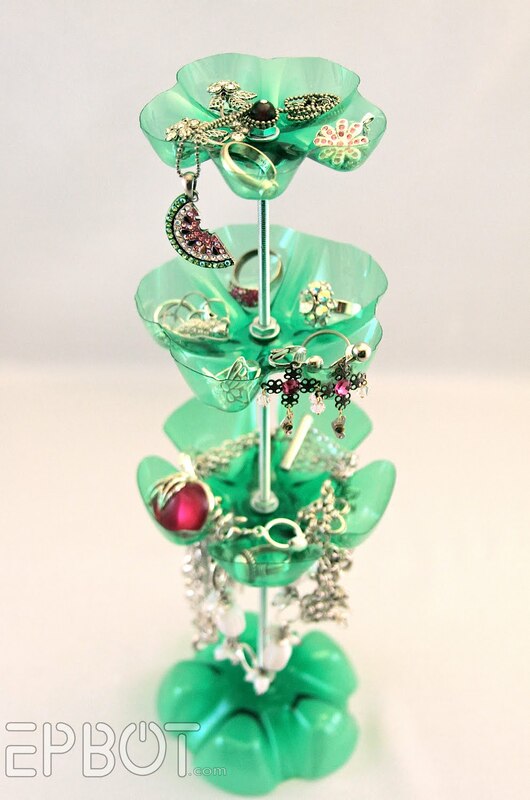 Now if I only had space for a jewelry stand. Mine all goes on picture frames. Krylon has a very good plastic paint--my dad used it to paint his plastic laptop case. I think it would be fun to use a clear bottle (I drink enough Diet Coke that I'd have enough bottles in a day) and make it my own color! I'm interested in how you've kept your cats from knocking it over and scattering everything. Mine would have that thing tipped over in an instant. Anyone have any cat proofing ideas? A spray bottle of water works well after a few squirts they decide to leave it alone. Pretty and clever! Posted at The Storage Geek with full credit and link back. So cool that I raided the recycling at work and did this as soon as I got home. It could be a little bit more stable, but I'm totally loving it! Love it! Any way to use up the cumulative waste of plastic drink containers is great but something this pretty is brilliant! Thanks for the tutorial. That's so cool. I love that idea. This is so great! I've been working with plastic bottles recently, but it still took me a minute to recognize them here. Great idea and great tutorial! cheap and earth friendly, fantastic! I'll make one for me. If ya want colors, prepare the bottle bottoms as usual. turn them wrong side up on a sheet of newspaper. Spray with spray paint made especially for plastic. Be sure and spray the WRONG side. 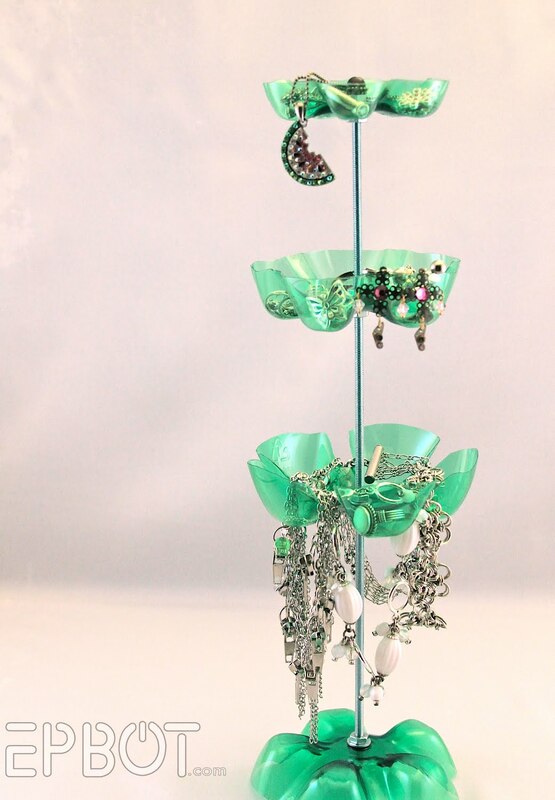 This will keep the cup side that actually holds your jewelery shing and slick. Regarding your picture #9 you said, "expect to spend a good five minutes spinning the middle tray into place." My God! What a wonderful idea! I'll make one for me now. I am so glad you tagged your images. I had pinned this weeks ago and have since been collecting my bottles. (Total Dr. Pepper hound up in here.) I went back to my pin only to find that Pinterest flagged the link as spam! But your pinned image had your name, so I easily located it. Now I'm going to repin it. Can't wait to get my rod and paint mine! Nossaaa!!!! Ideia fantástica. Irei fazer para mim. At first I didn't thought it would be pretty, but when i finished mine I saw it's really gorgeous! Thank you! super cute! 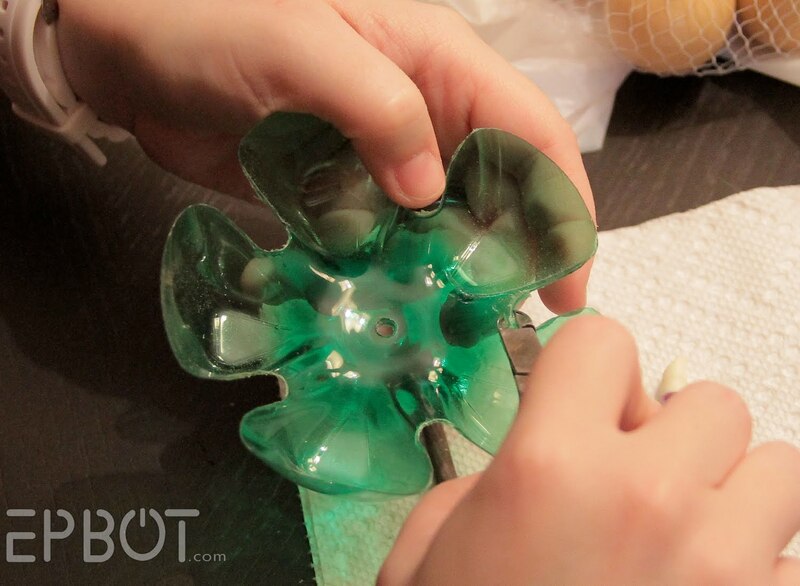 You can make clear bottles any color you wish even multi-colored with a bit of Elmer's glue and what ever color food coloring or tempra paint you want and just brush it to the underside so it doesn't get scratched up. 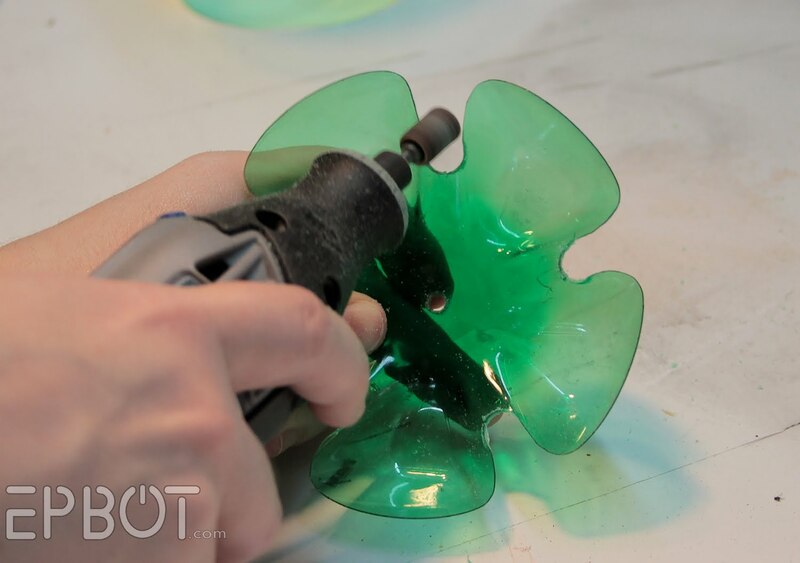 When the glue dries you will still be able to see through the bottle just now it will be tinted. I can't wait to make these for my neices! Seagram's Ginger Ale Bottles are green, you could use those if you don't do the caffiene thing like myself. Love this idea, what a cute Christmas gift for co-workers or teachers. Holy crap! Fabulous project! Whatta brain! Girl, YOU are phenomal woman! If you don't have a dramel, some sand paper wrapped around a pencil and secured with some double stick tape (along with some elbow grease) could work. Or a cheap mani/pedi wand with the different attachments, maybe? I never could use those right, but I'd buy one for crafting for sure! glad you added this comment because I was just wondering how I was gonna do this without a dramel. Thank you for including such clear instructions and great photos. You could use A&W root beer bottles and gold hardware to make a very pretty antique look! pva glue and food colouring works very well. So I am going to make these but use a 3 liter bottle for the bottom and have it sitting upwards to use as another bowl. You can get 3liters of soda at Dollar General. I'm making them for Christmas presents and plan to paint the outsides different colors for each of my friends. I am so excited because I thought I was going to have to skip giving presents this year, but my girlfriends will love these!! I will be sure to send you pics when I get them all done! I frequently use the top side of 2 liter bottles as funnels for refilling juice containers, but never thought to use the bottom side for anything. Now all we have to do is find an amazing use for the middle! What size screw dowels did you use? They come in all sizes? I now it is 12" long but what size around? I'm sorry, I don't remember! It's the one standard size they had at the hardware store for that length, though, so I don't believe you'll even have other choices. Good luck! Wow, that is so awesome! Absolutely love it! You could probably colour these with Inktense because as the name suggests it is an ink. You get them in pencils or blocks like watercolour and you use them exactly as you would with W.C you can actually water them and even mix the colours to paint on. When dry they dont bleed. Im pretty sure they would work on plastics. Why not just buy the large Lemonade or Cream soda and after kids have drunk the contents dye them as suggested. If that dont work you could stick on with a glue that dries clear some transparent coloured cellophane that florists use before cutting out and shaping.. OR why not leave clear and add some embellishments..
Can't wait to try this! And your right...I can't craft without my cats playing with what I am working on! :) I am going to use Coke bottles instead as I don't really like Mountain Dew, but my friends have been told to save me bottles if they do drink it!!! I love this idea! I've saved bottles just 'cause I don't like to throw them out; I know they have great use. When I Googled this your site came up and I love it! Actually, I'm going to use the empty Canada Dry ginger ale bottles (diet) which are green also. I'm trying to fashion a design for the empty water jugs that I saved in case anyone has any ideas. Thanks! What you think of it, let me know. This is an amazing idea....! Didn't see that anyone mentioned this-you could draw or color (I'm thinking groovy flowers) on the underside of clear bottles with permanent markers and it would show through, and not get scratched. I love the Christmas tree idea, too-so much you could do with that! Root Beer bottles are brown. Canada Dry gingerale is in a green bottle maybe some of the other flavors are colored too.